Fipronil is a broad spectrum insecticide that in the European Union (EU) is not permitted to be use with food producing animals. Fipronil sulfone is formed by degradation of fipronil, and is actually more toxic to birds and other organisms than the parent compound. 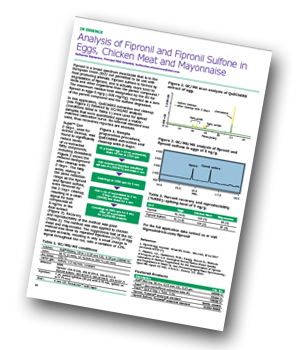 The maximum residue limit designated by the EU for fipronil in eggs 5 ng/g (.005 mg/Kg), reported as a sum of the parent compound and the sulfone degradant. In this application, described by Katherine Stenerson, QuEChERS extraction and cleanup, followed by GC/MS/MS analysis were used for spiked samples that were quantitated against a matrix-matched calibration curve. No internal standard was used, thus recoveries reported are absolute. Supel™ Que Z-Sep+, used for extract cleanup, was found to significantly reduce levels of co-extracted fatty compounds, including cholesterol. The fatty acids, eluting in the same retention range as the fipronil and fipronil sulfone, were removed by the Z-Sep+ cleanup, resulting in a clean signal for both compounds at 5 ng/mL in the final extract. Recovery and reproducibility of the method was good. The method was also applied to chicken meat and mayonnaise. The ruggedness test of the GC method was done by repeated injections (>70) of egg sample extracts, resulting in only a small change in signal throughout the run, with a variation of 12%.